As soon as I read the book description, I was pulled to the storyline about three sisters who take a road trip. In my family we are three sisters and I like stories that center on sisterhood. It's Hanna's wild idea, of course: take their mom's car, pack up the tent, and drive across the country. Just three sisters, one guitar, and the Trans Canada Highway. They can be back in Nova Scotia before their parents are home from Europe. She doesn't say she wants to forget about what happened in Italy, and at university. Claire doesn't say she keeps having nightmares about her friend's recent suicide. Megan doesn't say much, unless it's a complaint. But maybe they all feel, somehow, that this is their one chance to do something together, something big, before time begins to scatter them. 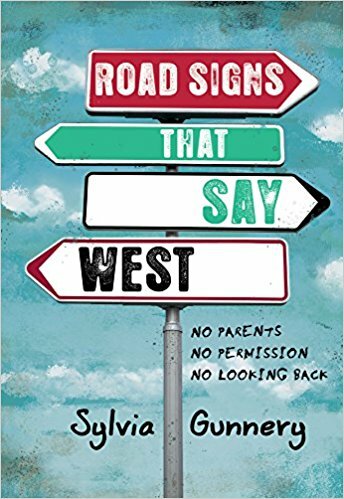 With empathy and insight, Sylvia Gunnery writes an engaging summer read about three sisters navigating the difficult roads of adolescence, trauma, secrets, shame, and fear for the future. Peopled with chance encounters and warmed with fireside heart-to-hearts, Road Signs that Say West is a compelling ride through real life. As soon as I read the book description, I was pulled to the storyline about three sisters who take a road trip. In my family we are three sisters and I like stories that center on sisterhood. I liked that the trip was across Canada from Nova Scotia to Vancouver, including a stopover in my city of Montreal. For the most part I did enjoy this book, but the writing had me confused at times. I found myself rereading certain sections to make sure I did not miss anything. I think the author used the omniscience point of view and jumping from one perspective to another was jarring and confusing at times. I liked all three sisters, even surly Megan. All three sisters were different and had their own issues. I'm not sure that these issues were resolved though, and the ending left me unsatisfied. The best part of the novel was how the sisters experienced life together and grew closer by the end of the trip, although it was in subtle ways. I also found the parents to be too relaxed when they found out the girls just up and left to drive across the whole country, especially after the traumatic emotional situations they experienced. Suicide of a close friend and sexual harassment and stalking are big issues to deal with, and I think parents would tend to stay close to help their kids deal with their grief, loss and fears. Disclosure: Thanks to Pajama Press for sending me this book for review. I was not compensated in any other way, nor told how to rate or review this product.